Google Adwords is giving away free promotional coupon codes to so many webmasters and bloggers since a long time, but so many users are struggling to use and Redeem Google Adwords Coupon code and are not able to use Google adwords promotional coupon code. I have also received one $100 Promotional code which was valid for only 15 days only. Now the question is how to use the coupon code, where to put the Google Adwords Promotional code and redeem the money. Go through the article and you will have a solution to your problem surely. 1) Your Google Adwords promotional code (must not be older than 15 days, Promotional offers are usually limited to one per customer). 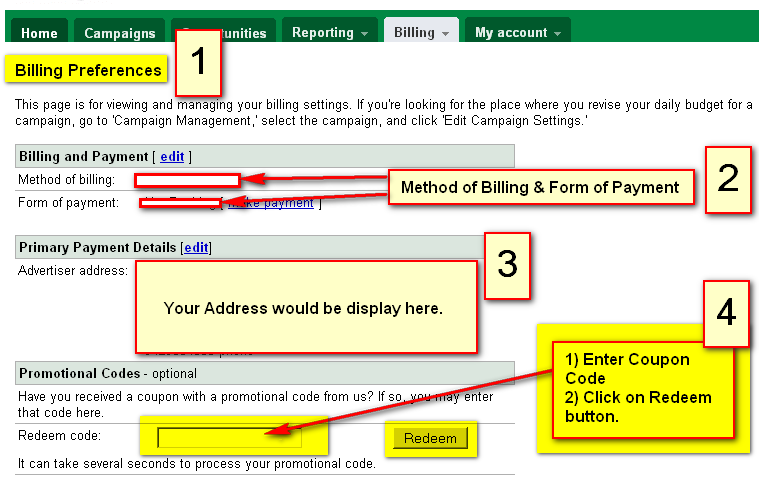 2) An Active Google Adwords Account (you first have to enter your billing information. Valid payment information is required to activate your AdWords account). Navigate to the Billing and Billing preferences. Note: After redeem don't get panic if your bespoken credit is not credited in your account, wait for 15-20 Minutes after redeem, because some time it can take some time to credit the money in your Google adwords account. Promotional offers are usually limited to one per customer. An expiration date often applies, so keep in mind that you may only have a certain amount of time to use your credit. Often, the code is only valid for 14 days from the date your new account is created. If you are about to sign up with a service offering you an AdWords promotional credit, be sure to confirm that the service has a relationship with Google. If you have any questions about an offer, please contact us before committing. If you receive a promotional code from a service that you have no business relationship with, please be aware that the code may be invalid. Get free information related to "How to Redeem Google Adwords Promotional Coupon Code". Hi I have Adwords promotional code, can you let me know if I can continue running a normal ads from the balance amount left from the Promotional code.